You'll be £14.99 closer to your next £10.00 credit when you purchase Follow Me! I Will Lead You!. What's this? Order within the next 4 hours, 10 minutes to get your order processed the next working day! 'Follow me! I will lead you!' were the last words of Lt. Col. George Brenton Laurie, who commanded the 1st Battalion Royal Irish Rifles and was killed at Neuve Chapelle in March, 1915. He died with his revolver in hand while leading his men in an assault on the German lines. Laurie left behind a remarkable collection of letters, which provide us with a privileged insight into the day to day experience of a battalion commander and his struggles to make sense of the developing madness of trench warfare. 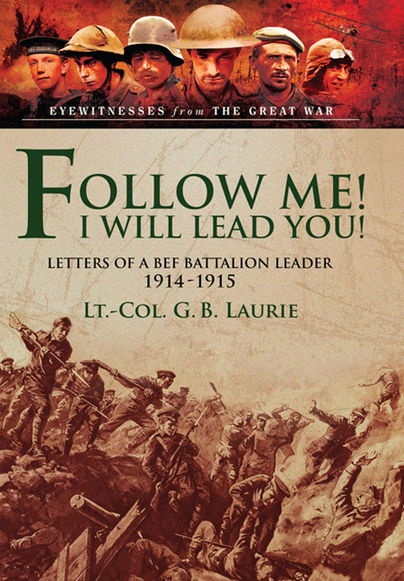 Leading his battalion amidst the constant mud, shelling, sniping and waterlogged trenches of Flanders occupied every waking moment of the life of Lt. Col. Laurie, from the moment the battalion was deployed in November, 1914 through to his death in March, 1915.
the BEF as witnessed from the perspective of a battalion commander. George Brenton Laurie was a highly distinguished author and army officer, who proved himself in many fields of combat. Laurie spent his childhood in Oakfield, Nova Scotia, before receiving his first commission in the Royal IrishRifles in 1885. Laurie proved himself a more than capable soldier and leader during the years of the Boer War, where he commanded a mounted infantry battalion. Laurie continued to thrive and was awarded the Queens Medal with five clasps for his actions. Laurie later served in the Great War, acting as Colonel. He fought bravely until 12 March 1915 where he was shot leading his troops in an assault at the Battle of Neuve Chapelle.